→How Much Should a Cat Eat? First-time cat owners could get confused. 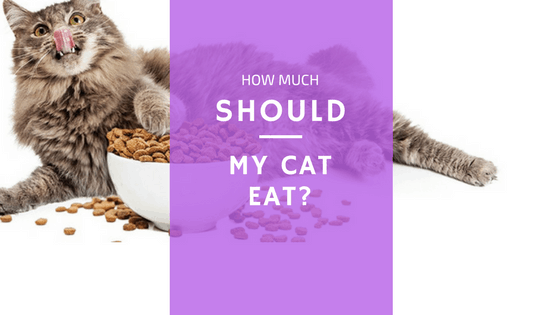 How much should a cat eat? Many believe you just put food in its bowl and refill it when you notice there’s no more left. While that’s certainly one way to feed your cat, it pays to pay a little more attention. Feeding your cat certainly doesn’t need to be a science. However, a little effort, research, and scheduling can go a long way to keeping your feline healthy. If you head over to your local grocery or pet food store, you’ll find dozens of cat food varieties in the pet food aisle. This is because each and every cat has different health needs. The amount of food you feed your furry friend and the frequency depends on the age, preference, and health of your feline. If you feed your feline too little food, he won’t be happy. Too much food and he won’t be healthy. The wrong kind of food could lead to feline malnourishment. Without proper food and schedule, your cat will struggle to stay in good health. Before we dive into different factors and schedules, let’s dive into the most important aspect: routine. Your cat needs structure and routine in his feeding schedule. By finding food your furry friend likes and feeding him at the same times every day, you’ll be way ahead of the game. 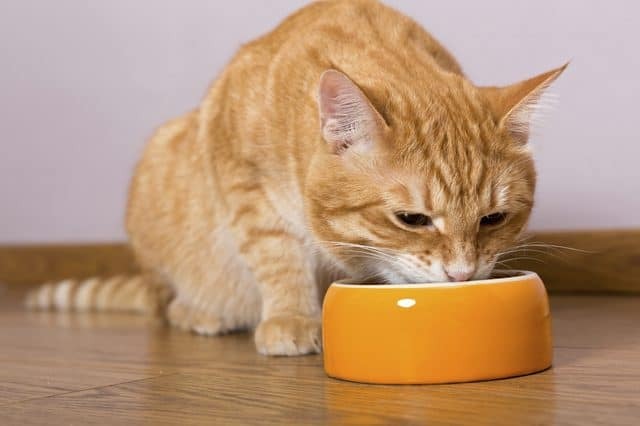 Sticking to a feeding routine offers a lot of benefits to cat health. Your cat’s body and system will adjust and learn to keep him healthy with the food and schedule – as long as you stick to it. Older cats have way different feeding needs than kittens. If you’re feeding your new kitten like your old cat, both of them will likely suffer from nutritional issues. That’s not what we want. For kittens under the age of eight months old, they’ll require a lot more food per pound of bodyweight than a full-grown adult cat. This means that kittens will need to eat more often throughout every day. Most kittens need to be fed three full meals every day. Mature cats don’t need three meals a day. In fact, a mature cat eating three meals a day will likely get fat. Most mature felines do well on a feeding schedule of twice a day. If your cat has an illness, then their feeding schedule will be different. Cats with diabetes or hyperthyroidism may be hungry all the time. You may need to feed these types of cats differently. For example, a cat with diabetes will often be administered insulin. In these times, the cat will need to eat after receiving the insulin. Cats with hyperthyroidism will want to eat 24/7, but you’ll need to take them to the vet and treat the issue first and foremost. Older cats often have teeth issues. They teeth go bad, or they end up with gum disease. This makes it quite difficult to chew dry food. When this happens, most cats need to go to an all wet food diet. The cat food debate rages on. 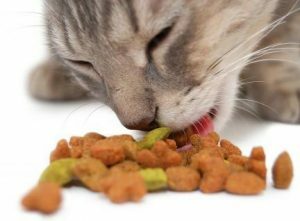 Dry versus wet food is something cat owners will battle about for ages. While both types of cat food can keep your cat in good health, we’ll break it down for you. Wet cat food is almost always better for your cat than dry food. As cats need to get most of their hydration from food and not drinking, wet food is overall better for felines. However, wet food presents problems for many cat owners. First, wet cat food is more expensive. Second, wet food rarely has the shelf life of dry food. Lastly, you can set out wet food all at once. Your cat will simply eat it all in one sitting. Our furry friends just love wet cat food too much. Dry food isn’t necessarily bad for our furry friends. It’s just not as good as the wet food. If you’re committed to feeding your cat dry food, then make sure you get a high-quality type that’s balanced and complete. Ultimately, you have a life outside of your furry friend. You need to consider your schedule and budget when deciding how to feed your cat. If budget is of no concern and you have some free time, then an all wet food diet could work well. If you live a hectic life, then an high-quality dry food and an automatic cat food dispenser could be what you need. There’s only so much time we each have in every day. For many cat owners, we recommend a compromise. Have an automatic cat dispenser that offers your cat food whenever he is hungry. Then offer your cat wet food on top of this once or twice a day – at your convenience. There’s no exact answer to how much cats should eat. Every cat is different. Follow the advice above, and you’re sure to keep your cat healthy and happy. Ultimately, that’s the most important thing – a frisky and fun furball.